The Catholic Centre for Immigrants’ mission is to welcome immigrants and refugees, enable their integration and build a more welcoming community in Ottawa. We are a non-profit organization whose mandate is to provide assistance to immigrants and refugees. We have a long history of working with refugees and we support privately sponsored refugees through our pastoral and sponsorship program. Now more than ever, it is of the utmost importance that Canada continues to be a place of refuge. The world is in the midst of a refugee crisis of unprecedented proportions. According to the Office of the United Nations High Commissioner for Refugees (UNHCR), there are nearly 60 million forcibly displaced people fleeing war, persecution, and danger worldwide. Although most are displaced within their own countries, over 14.4 million fall under the UNHCR mandate as refugees. This primer is intended to provide basic information on the history and legacy of refugee resettlement in Canada and to highlight Ottawa’s role in these efforts. It contains basic facts about refugees and Canadian refugee policy, a brief timeline of refugee resettlement in Canada, highlights from Ottawa’s history of refugee resettlement, and a myth buster intended to dispel some of the misconceptions about refugees and refugee resettlement history in Canada. Ottawa, ON – January 22, 2016 – The Catholic Centre for Immigrants (CCI) today made a public appeal for Ottawa residents to offer vacant housing to newly arrived refugees, and helped to launch a new website to help connect those offers to refugee families. Like so many Syrians, the Al Dakhil family fled their home town because of extreme violence and insecurity. Various bomb threats at their children’s school, the looming danger of gunfire around their home and, finally, a gunshot injury to Mr. Dakhil’s foot, drove them to take the final decision: escape from Syria to Lebanon. During what became known in the media as ‘The Arab Spring’, fighting in Syria escalated into civil war. At the time of writing the conflict involves over a dozen countries. All statistics should be handled with caution, but UNHCR estimates that of a population of less than 18 million Syrians, over 7 million have been internally displaced and over 4 million have fled the country. Hundreds of thousands have been killed and injured, and the war continues. There are many different routes taken by the refugees, all involving risk and many dependent upon smugglers of humans. The journey from Libya to Italy and the crossing from Turkey to Greece are well known, and some have even made a journey from Russia to Norway, with 420 refugee claimants (known in Europe as Asylum Seekers) arriving in Northern Norway by bicycle in September 2015. Negotiations between EU member states to design and implement solutions to the crisis are ongoing. Most will know the story of Alan Kurdi, a 3-year-old Syrian Kurdish child who died along with his mother Rehana and brother Galib when the boat they were being transported in capsized off the Turkish coast. Photos of Alan’s body brought a massive increase in attention to the European Refugee crisis. The Kurdi family had fled their hometown of Kobani, returned when they believed it to be safe, and been forced to leave again when the town came under further attack. The Kurdi family were trying to reach Canada. “Canadians get it. This is about doing the right thing.” Justin Trudeau. In line with election promises, the Canadian government plans to bring 25, 000 Syrian refugees to Canada by January 2016. This is an unprecedented commitment that has been welcomed as a gesture that other countries should follow by the UN High Commissioner for Refugees Antonio Guterres. Canada is also committed to supporting humanitarian efforts in the Middle East and elsewhere. Each year 35 million people are forced to flee their homelands to escape persecution, war or severe human rights abuses, according to the United Nations Refugee Agency (UNHCR). Often these people can never return home and about one third are officially recognized as refugees. A refugee is someone who has been forced to flee his or her country because of persecution, war or violence. Most likely, they cannot return home or are afraid to do so. War and ethnic, tribal and religious violence, sexual orientation and gender violence are leading causes of refugees fleeing their countries. Persons who, even before their arrival to Canada, have been sponsored by the Government of Canada as Government-Assisted Refugees (GARs) or by a private group. They are called Convention Refugees. They might have been waiting in one of the world’s many refugee camps for years before being selected to resettle in Canada as permanent residence and future Canadian citizens. Persons who make their own way out of the country or situation they are fleeing. 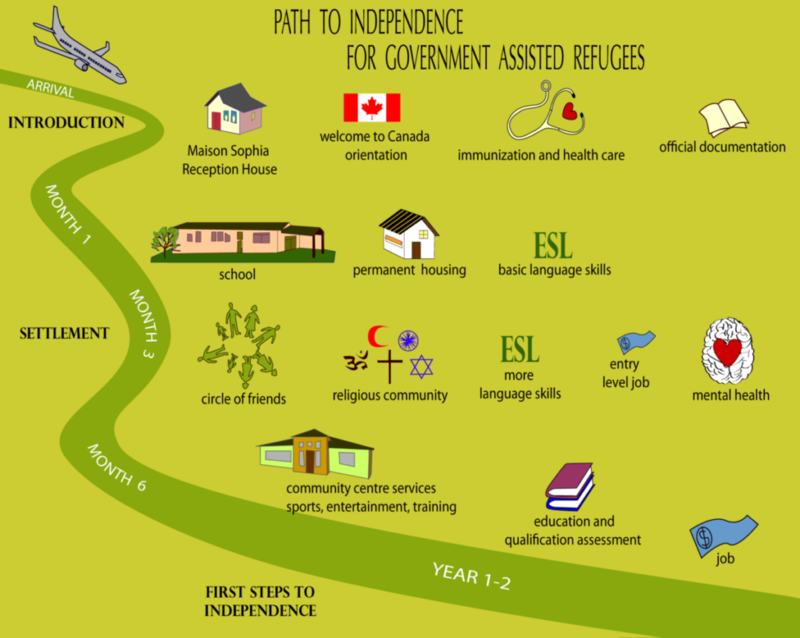 After reaching Canada by land, sea or air, they apply for asylum through the in-land refugee determination system. They are called Refugee Claimants. If they are carrying valid identity documents, they can live in the community while they await a hearing to determine their case. If their documents are missing or are suspicious, they may be held in detention until their identity can be confirmed. referrals to other refugee programs. News Conference hosted at CCI Ottawa on Sept 13th 2015. (left to right) Mayor Jim Watson, Carl Nicholson, MPP John Fraser, MPP Yasir Naqvi.